Lake Placid, Florida is in Highlands County, Florida. It's population is about 2,000. Lake Placid's nearest big neighbor is Sebring to the north through several miles of rolling hills among fragrant orange groves along US-27. 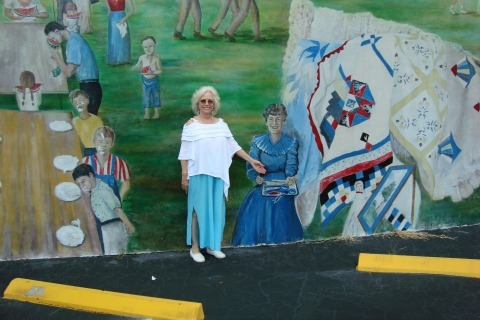 The town is a mecca for mural lovers, with more than 40 murals painted on buildings throughout the town. 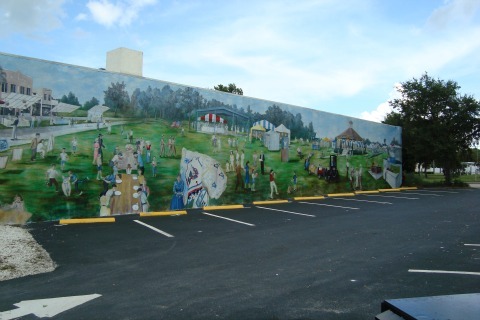 These murals transform what was a typical little Florida town into an outdoor art gallery. The town was originally called Lake Stearns and was founded in 1925. Dr. Melvil Dewey, the inventor of the Dewey Decimal System, bought a lot of acreage in the area. He was the founder of the Lake Placid Club in New York, and convinced the town and state to go along with changing the name of Lake Stearns to Lake Placid. Lake Placid is also famous for producing 98 percent of the world's caladium bulbs. To celebrate this distinction, the town holds an Annual Caladium Festival. The 25th annual event is being held on July 24-26, 2015. This festival has tons of bulbs and plants for sale, along with dozens of arts and craft booths and a lot of other exhibits. There is usually an antique car show, along with all kinds of caladium competitions. They even have a swamp buggy display. Lake Placid is a good place to start a day trip around the lakes in the area, including Lake Placid and Lake June-In-Winter. The area has a distinctly charming rural feel although many large developments, such as Placid Lakes, sprawl over the area. Henscratch Farms Winery is west of Lake Placid and is worth a visit. There are also several neat little Mom and Pop type resort hotels along the shore of Lake June-In-Winter making it an appealing vacation destination. An interesting day trip is to go south from downtown Lake Placid along SR-17, also known locally as Old State Road 8. It will take you down to the ghost towns of Venus and Old Venus about 12 miles south through rolling grove country.